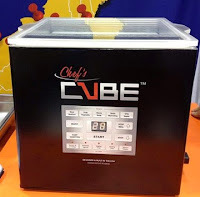 The TTABlog®: TTAB Test: Is CHEF'S CUBE Merely Descriptive of Vacuum Packaging Machines? TTAB Test: Is CHEF'S CUBE Merely Descriptive of Vacuum Packaging Machines? Joseph E. Sielski applied to register the mark CHEF'S CUBE for "vacuum packaging machines for sealing plastic pouches" (Int'l Class 7), but the USPTO refused registration under Section 2(e)(1), deeming the mark merely descriptive of the identified goods. The examining attorney argued that such machines are used by chefs and are commonly cube-shaped. Applicant asserted that its machines may be used by individuals other than chefs. How do you think this came out? In re Joseph E. Sielski, Serial No. 86032662 (May 21, 2015) [not precedential]. The examining attorney relied on dictionary definitions of "chef" and "cube," as well as on numerous website pages displaying vacuum packaging machines for sealing plastic pouches containing food. [Applicant's device is shown above]. The evidence established, and applicant acknowledged, that vacuum packaging machines may be cube-shaped and may be used by chefs. But the evidence failed to show that a cubic shape is a significant feature of those machines. The evidence ... clearly indicates that vacuum packaging machines are produced in a variety of shapes other than cubes, strongly suggesting that the cube shape of Applicant’s goods is an arbitrary, aesthetic or practical choice of product design. The Examining Attorney fails to explain how the cubical shape of Applicant’s goods is a significant feature, aspect or characteristic of vacuum packaging machines such that the mark CHEF’S CUBE may be merely descriptive of thereof. Distinguishing several prior rulings, the Board observed that here the mark describes an intended user and one of may shapes in which the goods may be made. It noted that a mark like CHEF'S VACUUM may describe an end user and a significant characteristic of the goods. But CHEF'S CUBE does not. TTABlog note: Doesn't "cube" describe the shape of applicant's goods? Should CUBE be disclaimed? The word "cube" does describe the applicant's goods, but that doesn't make it "merely descriptive." In my view the Board reached the right result. I agree that "cube" describes an aspect of at least one form of Applicant's goods, but that is not a necessary aspect. It is not a functional aspect which would require a disclaimer (particularly in the context of the entire mark). I believe that the Board reached a logical and rational decision in this case and hope that it helps to curb the overzealous refusals of marginally descriptive (and even suggestive) marks by Examining Attorneys. I always thought that the standard was "merely" descriptive and there are lot of marks that have descriptive characteristics but fall far short of the "merely" standard. This is in line with the Board's BLUECAR decision from 2010.